Sir W. Billers & al. against D. of Norfolk. The Answer of Edward Duke of Norfolk and others, to the Appeal of Sir William Billers and others, was brought in. As was likewise, the Answer of Edward Edgworth Esquire, to the Appeal of Robert Edgworth a Minor, by his Guardian. The House being moved, "That a Day may be appointed, for hearing the Cause wherein Sir William Billers & al. are Appellants, and Edward Duke of Norfolk & al. Respondents:"
E. Cowper & al. Pet. referred to Judges. It is Ordered, That the Consideration of the said Petition be, and is hereby, referred to the Lord Chief Justice of the Court of King's Bench and the Lord Chief Baron of the Court of Exchequer; with the usual Directions, according to the Standing Order. Hodie 3a vice lecta est Billa, intituled, "An Act for vesting a Messuage and Lands in Twickenham, late the Estate of the Honourable William Townshend Esquire, deceased, in Trustees, in Trust, to sell the same, pursuant to an Article entered into by the said William Townshend in his Life-time; and for applying the Money arising by such Sale for the Benefit of Charles Townshend, his only Son and Heir, an Infant." D. Newcastle & al. Pet. referred to Judges. It is Ordered, That the Consideration of the said Bill be, and is hereby, referred to the Lord Chief Justice of the Court of King's Bench and the Lord Chief Baron of the Court of Exchequer; with the usual Directions, according to the Standing Order. Brewer to take the Name of Risley, Bill. Hodie 2a vice lecta est Billa, intituled, "An Act to enable Risley Brewer and his Heirs to take and use the Surname and Arms of Risley, pursuant to the Will of Paul Risley Esquire, deceased." Hodie 2a vice lecta est Billa, intituled, "An Act for enclosing Part of certain Common Fields, in the Township of Pailton, in the County of Warwick." Their Lordships, or any Five of them; to meet at the usual Time and Place, on Thursday the Fifth Day of April next; and to adjourn as they please. Hodie 1a vice lecta est Billa, intituled, "An Act for discharging several Lands in Nosely, in the County of Leicester, purchased by the Executors of Philip Earl of Chesterfield, deceased, from the Uses and Limitations contained in the Will of the said Earl; and vesting the same Lands in Trustees, to be sold; and, with the Money arising thereby, to purchase other Lands, to be settled to the same Uses." Hodie 1a vice lecta est Billa, intituled, "An Act for confirming certain Articles of Agreement, made between Edward Westall and his Wife and Robert Corr, to perform a Contract for Sale of certain Lands therein mentioned." Mould to take the Name of Moore, Bill. The Earl of Warwick reported from the Lords Committees to whom the Bill, intituled, "An Act to enable John Mould Esquire and his Issue Male to take and use the Surname and Arms of Moore, pursuant to the Will of John Moore Esquire, deceased," was committed: "That they had considered the said Bill, and examined the Allegations thereof, which they found to be true; and that the Committee had gone through the Bill, and directed him to report the same to the House, without any Amendment." His Lordship made the like Report from the Committee to whom the Bill, intituled, "An Act to enable John Crouch Esquire Eldest Son of Pyke Crouch Esquire, deceased, and the Heirs Male of his Body, to take and use the Surname of Pyke, pursuant to the Will of John Pyke Esquire, deceased," was committed. The House being moved, on Behalf of Packington Edgworth Gentleman, Respondent to the Appeal of Robert Edgworth a Minor, by his Guardian Robert Roberts Esquire, "That a Day may be appointed, for hearing the said Appeal:"
It is Ordered, That this House will hear the said Cause, by Counsel, at the Bar, on Thursday the 12th Day of April next. Sir J. Mackenzie, of Royston's, Bill. The Earl of Findlater reported from the Lords Committees to whom the Bill, intituled, "An Act to enable Sir James Mackenzie, of Royston, to sell Lands and Hereditaments, in the Sheriffdom of Edinburgh, for Payment of Debts and Encumbrances charged upon and affecting the same," was committed: "That they, having considered the said Bill, with the Report of the Judges to whom the Petition for Leave to bring in the same was referred, conceived a Difficulty arose, how far the Consent of Parties is satisfactory in this Case; for it is in the said Report mentioned, "That, if the Consent is satisfactory, the Judges imagined the said Bill might be proper for the Purposes thereby intended, and might be fit and reasonable to pass into a Law." "The Committee therefore carefully examined this Case with the Consents given; and find, that George Viscount of Tarbat, afterwards Earl of Cromarty, did, by Deed of Entail, bearing Date the 28th of November 1688, give, grant, and dispone, the Lands and Barony of Roystoun, now intended to be sold, to Sir James McKenzie the Petitioner, his Third Son, and the Heirs Male of his Body; which failing, to Sir Kenneth McKenzie his Second Son, and the Heirs Male of his Body; which failing, to John Master of Tarbat, afterwards Earl of Cromarty, and the Heirs Male of his Body. "That, of the Heirs thus called to the Succession of this Estate, Sir James McKenzie the First Institute hath signed the Petition; that George McKenzie his only Son, and Sir George, James, Kenneth, and Gerard M'Kenzies, the Four Sons of Sir Kenneth the Second Person named in the Entail, and also George the present Earl of Cromarty, Eldest Son and Heir of the Third Person named in the said Deed of Entail, for himself and on Behalf of his Infant Son, as likewise on Behalf of James, Hugh, and Norman M'Kenzies, his Infant Brothers; as also Roderick McKenzie, immediate Younger Brother of the present Earl of Cromarty, for himself and his Infant Son, have, by several Writings under their Hands, signified their Consent that a Bill should pass, according to the Prayer of the Petition; and that the Consent of William and Patrick M'Kenzies, Third and Fourth Sons of John Master of Tarbat, afterwards Earl of Cromarty, and Brothers to the present Earl, who are now abroad in The Indies, is only wanted, of all the Heirs Male descending from the Maker of the Entail; which said Two Persons, being descended of George Earl of Cromarty, may succeed to him in his Honours and Estate; and, until all the Heirs prior to them in the Succession to the Estate of Cromarty are failed, they are not entitled to take the small Estate in Question. "That the said George Earl of Cromarty the Donor, posterior to this Entail, upon the 9th of April 1707, executed a Deed of Disposition, disponing the Lands formerly entailed upon the said Sir James M'Kenzie, his Third Son, to him in Fee Simple; upon which Deed of Disposition, a proper Charter of Resignation and Enfeoffment was had and registered; and by a subsequent Deed, under the Hand of the said Earl, dated the 17th July 1714, he did revoke and annual all the prohibitory, irritant, and resolutive Clauses in the said Deed of Tailzie contained; and which Deed of Revocation John late Earl of Cromarty did, by a Writing under his Hand, ratify and confirm; thereby obliging himself and his Heirs to discharge the Limitations contained in the Entail; by which Obligation, his Heirs, and consequently his Two Younger Sons now in The Indies, whose Consent is only wanting, if they shall succeed to him or their Grandfather, are bound to ratify the Disposition of the Lands in Fee Simple; and as by the Entail they can only claim under the Character of Heirs to their Father, their Consent does not appear to be absolutely necessary. "The Committee therefore taking into their Consideration, that the Expectancy of the said William and Patrick M'Kenzies is extremely remote; that the Father and Grandfather, and their Heirs (and in Consequence the said Two Sons, if ever they shall succeed as Heirs to them), are barred from quarreling any Alienation to be made by the said Sir James M'Kenzie; that, if the Sale does not proceed, the Estate may probably be carried off from all the Heirs by the Creditors; and that it is highly for the Interest of all who can take under the Entail, that this Bill do pass into a Law; did empower their Chairman to lay the Case before the House, with their Opinion, That, if their Lordships shall think fit, the Standing Orders, of the Date the 20th April 1698, and 16th February 1705, requiring the Consent and Attendance of all Parties having Interest in Cases of this Kind, may be dispensed with in this Case." It was moved, "That the said Standing Orders may be so far dispensed with, as that the Committee may proceed on the said Bill." Ordered, That the said Motion be taken into Consideration on Friday next; and the Lords to be summoned. The Lord Chamberlain reported, "That the Lords with White Staves (according to Order) had presented to His Majesty the Address of this House on Monday last, relating to the State of the National Debt; and that His Majesty had been pleased to say, He would give Order to the proper Officer, to lay the same before the House accordingly." 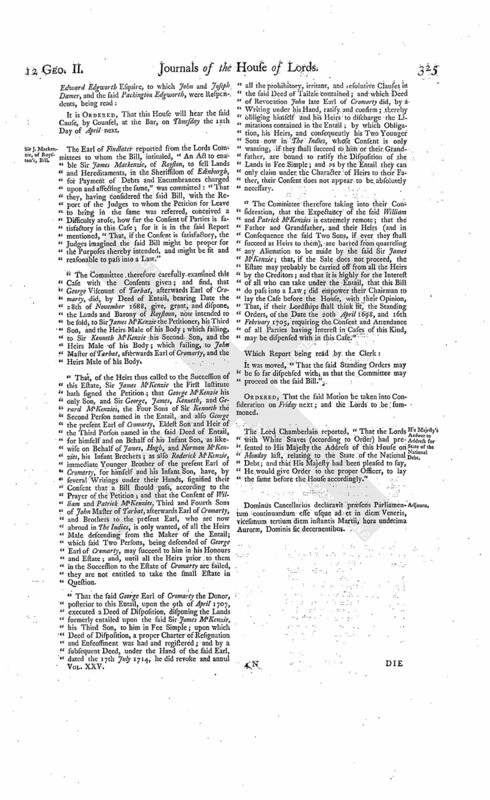 The joint and several Answer of Hercules Langford Rowley Esquire and Elizabeth his Wife, and Jane Langford Rowley their Daughter, and Catherine Fitzgerald Widow, Four of the Respondents to the Appeal of Thomas Butler Esquire, was brought in. The House being moved, "That a Day may be appointed, for hearing the Cause wherein Thomas Butler Esquire and others are Appellants, and Hercules Langford Rowley Esquire and others Respondents:"
Watts & al. against Daniel. Upon reading the Petition and Appeal of Robert Watts Clerk, Vicar of the Parish of Fidown, and Theobald Butler Gentleman, his Proctor; complaining of several Orders of the Court of Exchequer in Ireland, of the 11th of February 1737, 27th of January and 9th of February last, made in a Cause wherein Richard Daniel Dean of Down was Plaintiff, and the Appellants Defendants; and praying, "That the same may be reversed; and that the Appellant may have proper Relief, on a Motion by him made the 5th of May 1738, to set aside an Order for an Injunction granted by the said Court; and that he may have such other Relief as to the Wisdom of this House shall seem meet:"
It is Ordered, That the said Richard Daniel may have a Copy of the said Appeal; and he is hereby required to put in his Answer thereunto, in Writing, on or before Friday the 27th Day of April next; and that Service of this Order on his Clerk in Court be deemed good Service. The Earl of Harborough reported from the Lords Committees to whom the Bill, intituled, "An Act for discharging the Estate of John Sherwin Esquire, in the County of Hertford, from the Uses, Trusts, and Covenants, in his Marriage Settlement; and for settling an Estate in the County of Nottingham, and Town and County of the Town of Nottingham, of greater Value, in Lieu thereof, to the like Uses," was committed: "That they had considered the said Bill, and examined the Allegations thereof, which they found to be true; that the Parties concerned had given their Consents; and that the Committee had gone through the Bill, and made some Amendments thereunto. The Earl of Harborough also reported from the Lords Committees to whom the Bill, intituled, "An Act to enable Risley Brewer and his Heirs to take and use the Surname and Arms of Risley, pursuant to the Will of Paul Risley Esquire, deceased," was committed: "That they had considered the said Bill, and examined the Allegations thereof, which they found to be true; and that the Committee had gone through the Bill, and directed him to report the same to the House, without any Amendment." Hodie 3a vice lecta est Billa, intituled, "An Act to enable John Mould Esquire and his Issue Male to take and use the Surname and Arms of Moore, pursuant to the Will of John Moore Esquire, deceased." Hodie 3a vice lecta est Billa, intituled, "An Act to enable John Crouch Esquire, Eldest Son of Pyke Crouch Esquire, deceased, and the Heirs Male of his Body, to take and use the Surname of Pyke, pursuant to the Will of John Pyke Esquire, deceased." Sir J. Home peremptorily to answer. The House was informed, "That Sir John Home of Manderstone had not put in his Answer to the Appeal of Sir John Home of Rentoun, though due Service had been made of the Order of this House for that Purpose." Ordered, That the said first-mentioned Sir John Home do peremptorily put in his Answer to the said Appeal, in a Week. Hodie 2a vice lecta est Billa, intituled, "An Act for discharging several Lands in Nosely, in the County of Leicester, purchased by the Executors of Philip Earl of Chesterfield, deceased, from the Uses and Limitations contained in the Will of the said Earl; and for vesting the same Lands in Trustees, to be sold; and, with the Money arising thereby, to purchase other Lands, to be settled to the same Uses." E. Graham. L. Bp. Rochester. Their Lordships, or any Five of them; to meet on Monday the 9th Day of April next; at the usual Time and Place, and to adjourn as they please. Hodie 2a vice lecta est Billa, intituled, An Act for confirming certain Articles of Agreement, made between Edward Westall and his Wife, and Robert Corr an Infant, and others; and to enable the said Robert Corr to perform a Contract for Sale of certain Lands therein mentioned." Standing Order dispensed with, on Sir J. Mackenzie's Bill. 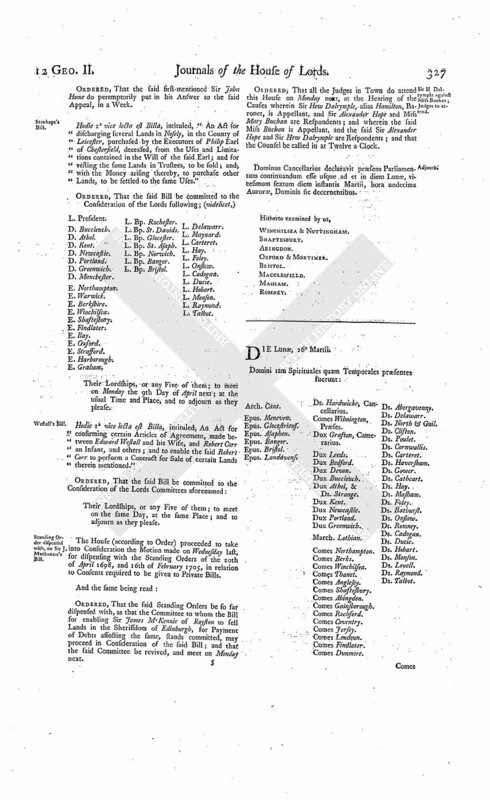 The House (according to Order) proceeded to take into Consideration the Motion made on Wednesday last, for dispensing with the Standing Orders of the 20th of April 1698, and 16th of February 1705, in relation to Consents required to be given to Private Bills. 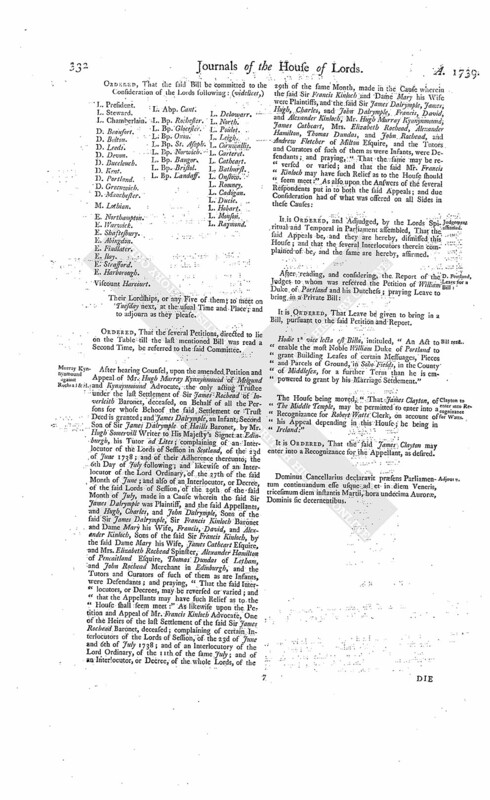 Ordered, That the said Standing Orders be so far dispensed with, as that the Committee to whom the Bill for enabling Sir James M'Kenzie of Royston to sell Lands in the Sheriffdom of Edinburgh, for Payment of Debts affecting the same, stands committed, may proceed in Consideration of the said Bill; and that the said Committee be revived, and meet on Monday next. Sir H Dalrymple against Miss Buchan; Judges to attend. Ordered, That all the Judges in Town do attend this House on Monday next, at the Hearing of the Causes wherein Sir Hew Dalrymple, alias Hamilton, Baronet, is Appellant, and Sir Alexander Hope and Miss Mary Buchan are Respondents; and wherein the said Miss Buchan is Appellant, and the said Sir Alexander Hope and Sir Hew Dalrymple are Respondents; and that the Counsel be called in at Twelve a Clock. The Answer of Thomas Hines, to the Appeal of Robert Proof, was brought in. Geddes against E. of Roseberry. As was likewise, the several and joint Answer of James Earl of Roseberry, and the Trustees for the Creditors of the said Earl, to the Appeal of Robert Geddes of Scotstoun. With a Bill, intituled, "An Act to enable the Inhabitants of the Parish of Saint Nicholas, in the City of Worcester, to raise Money, for discharging the Debts they have contracted in re-building their Parish Church;" to which they desire the Concurrence of this House. Sir J. McKenzie of Royston, Bill. The Earl of Findlater reported from the Lords Committees to whom the Bill, intituled, "An Act to enable Sir James McKenzie of Royston to sell Lands and Hereditaments, in the Sheriffdom of Edinburgh, for Payment of Debts and Encumbrances charged upon and affecting the same," was committed: "That they had considered the said Bill, and examined the Allegations thereof, which they found to be true; that the Parties sufficient had given their Consents; and that the Committee had gone through the Bill, and made some Amendments thereunto." 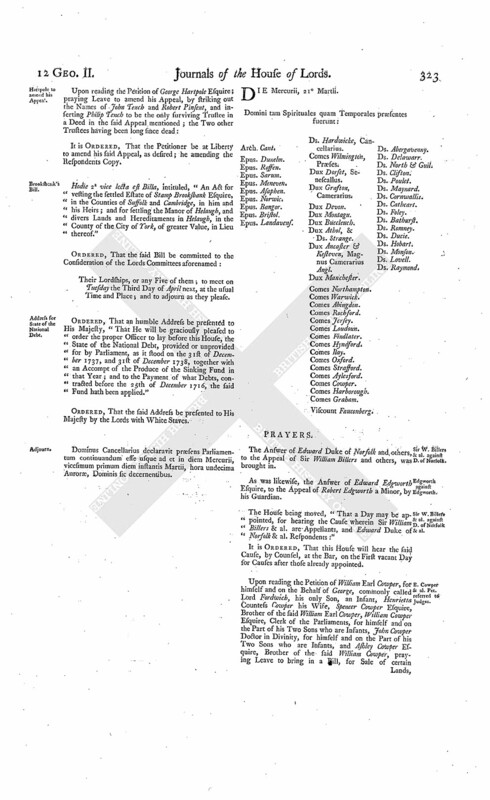 The House being moved, "That a Day may be appointed, for hearing the Cause wherein Robert Proof is Appellant, and Thomas Hines Respondent:"
The like Motion and Order, for hearing the Cause wherein Robert Geddes is Appellant, and James Earl of Roseberry and others are Respondents, on the next vacant Day for Causes. Message to H. C. with a Bill. With a Bill, intituled, "An Act for naturalizing James Tracy;" to which they desire the Concurrence of this House. Hodie 3a vice lecta est Billa, intituled, "An Act for discharging the Estate of John Sherwin Esquire, in the County of Hertford, from the Uses, Trusts, and Covenants, in his Marriage Settlement; and for settling an Estate in the County of Nottingham, and Town and County of the Town of Nottingham, of greater Value, in Lieu thereof, to the like Uses." Hodie 3a vice lecta est Billa, intituled, "An Act to enable Risley Brewer and his Heirs to take and use the Surname and Arms of Risley, pursuant to the Will of Paul Risley Esquire, deceased." A Messages to H. C. that the Lords have agreed to the Two preceding Bills. Sir H. Dalrymple against Miss Buchan, and Sir A. Hope, et è contra. It is Ordered, That the further Hearing of these Causes be adjourned till To-morrow; and that the Counsel be called in at Twelve a Clock. Dominus Cancellarius declaravit præsens Parliamentum continuandum esse usque ad et in diem Martis vicesimum septimum diem instantis Martii, hora undecima Auroræ, Dominis sic decernentibus. The Answer of Sir Walter Blake Baronet, to the Appeal of Gerald Burke Esquire, was brought in. The House being moved, "That a Day may be appointed, for hearing the Cause wherein Sir John Home of Rentoun is Appellant, and Sir John Home of Manderstone Respondent:"
The like Motion and Order, for hearing the Cause wherein Gerald Burke Esquire is Appellant, and Sir Walter Blake Respondent, on the next vacant Day for Causes. The like Motion and Order, for hearing the Cause wherein Sir George Caswall and others are Appellants, and Thomas Houghton is Respondent, on the next vacant Day for Causes. Hodie 2a vice lecta est Billa, intituled, "An Act to enable the Inhabitants of the Parish of Saint Nicholas, in the City of Worcester, to raise Money, for discharging the Debts they have contracted in re-building their Parish Church." Viscount Falmouth. L. Abp. Cant. Hodie 1a vice lecta est Billa, intituled, "An Act for naturalizing James Tracy." Reghlen and Nieman to be added to it. 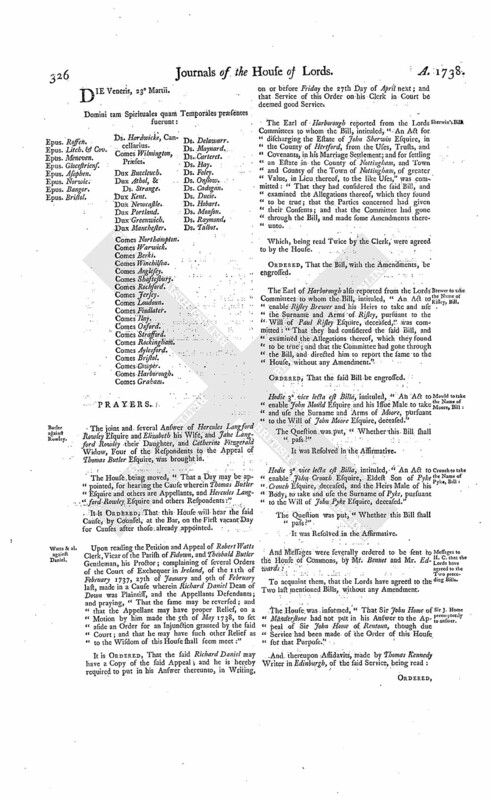 Upon reading the Petition of Christian Burckhard Reghlen; praying, "That his Name may be inserted in the last mentioned Bill:"
Upon reading the Petition of Zacharias Nieman; praying, "That his Name may be inserted in the said Bill:"
Hodie 3a vice lecta est Billa, intituled, "An Act to enable Sir James McKenzie of Royston to sell Lands and Hereditaments, in the Sheriffdom of Edinburgh, for Payment of Debts and Encumbrances charged upon and affecting the same." Langley & al. peremptorily to answer Quin's Appeal. The House was informed, "That Samuel Langley and others, Respondents to the Appeal of Valentine Quin Esquire, have not put in their Answer thereunto, though duly served with the Order of this House for that Purpose." Ordered, That the several Respondents to the said Appeal do peremptorily put in their Answer or respective Answers thereunto, in a Week. 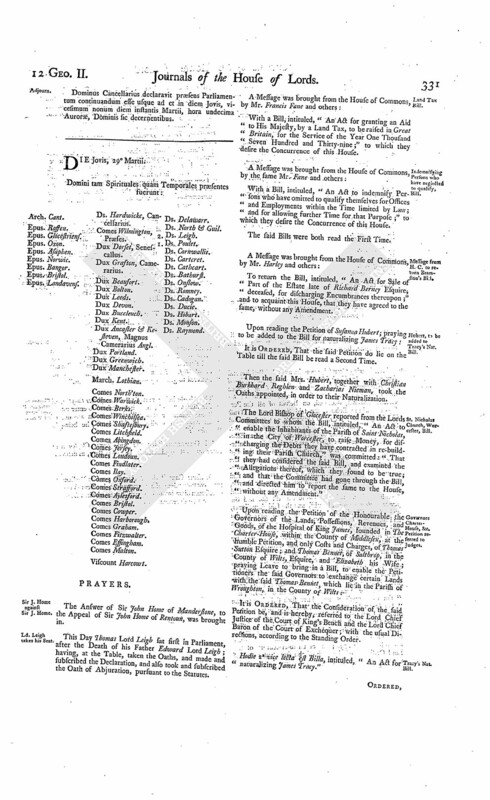 The House being informed, "That a Person from the Exchequer attended:"
"A State of the National Debt, provided or unprovided for by Parliament, on the 31st Day of December, 1738; together with an Accompt of the Produce of the Sinking Fund in that Year; and to the Payment of what Debts, contracted before the 25th of December 1716, the said Fund has been applied." Sir H. Dalrymple against Miss Buchan and Sir A. Hope: et é contra. It is Ordered, by the Lords Spiritual and Temporal in Parliament assembled, That the Appeal of the said Mary Buchan be, and is hereby, dismissed this House, without Prejudice to any Right that may hereafter accrue to the said Mary Buchan, or the Descendants of her Body, on Failure of any of the Heirs of Talzie mentioned or described in the Settlement of the 19th Day of June 1688: And it is hereby Ordered and Adjudged, That that Part of the Interlocutor aforementioned, of the said Lords of Session, of the 18th of January 1737/8, whereby they found, "That, by the Conception of the Talzie, the Succession to the Estate of Bargeny devolves on Sir Alexander Hope, Eldest Son to the only Daughter of John Lord Bargeny, and that therefore he ought to be served Heir of Talzie preferable to Sir Hew Dalrymple and Miss Mary Buchan," be, and the same is hereby, reversed: And it is further Ordered and Adjudged, That so much of the Interlocutor of the same Lords, of the 6th of July last, whereby they adhered to their said former Interlocutor, be, and the same is hereby, also reversed: And it is hereby Declared, That the said Appellant Sir Hew Dalrymple is entitled to the Estate in Question, upon the Failure of Heirs Male of the Body of John Lord Bargeny: And it is further Ordered and Adjudged, That the Interlocutor of the said Lords of Session, of the 16th of July 1736, whereby they found, "That the Estate of Bargeny doth descend to Hew Dalrymple of Castleton, Eldest Son to the Daughter and only Child of John Master of Bargeny; and that he ought to be served Heir of Talzie and Provision to James Lord Bargeny, preferable to Sir Alexander Hope of Kerse, Eldest Son to the only Daughter of John Lord Bargeny," be, and the same is hereby, affirmed. Quin's Petition to put off his Appeal, rejected. 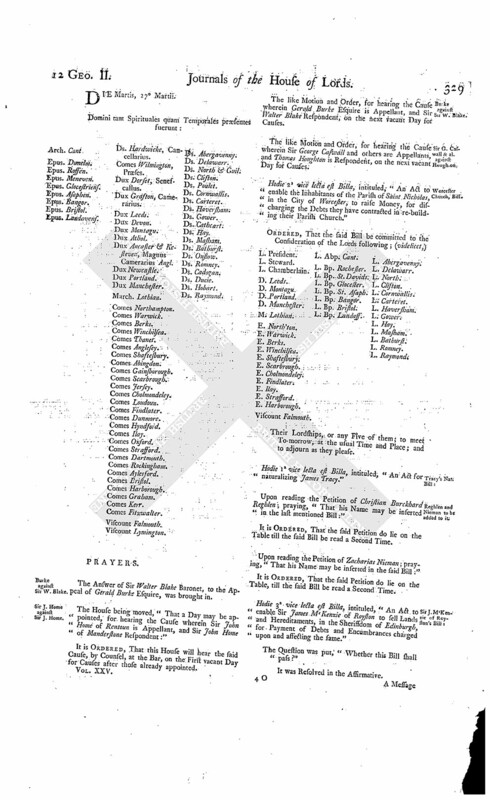 A Petition of Valentine Quin Esquire, was presented, and read; setting forth, "That his Appeal, in the last Session of Parliament, from certain Orders of the Court of Chancery in Ireland, stands to be heard on Friday next; but that the Petitioner hath another Appeal depending, brought in this Session, from Proceedings in the Court of Exchequer in that Kingdom; and that both these Appeals relate to the same Matter;" and praying, "That the same may come on together to be heard, at the Bar of this House; and, for that End, that the said Appeal, which is appointed to be heard on Friday next, may be adjourned over to such Time as the Petitioner may, by the Rules and Orders of this House, be entitled to set down the other Appeal for hearing; which he will do as soon as their Lordships Orders will admit of." Ordered, That the Hearing of the Appeals of Mr. Hugh Murray Kynnynmound and Francis Kinloch, to which Sir James Dalrymple & al. are Respondents, which stands for an Hearing To-morrow, be put off to the next Day; and the Hearing the Appeal of Valentine Quin, to which John Johnston is Respondent, which stands for Friday next, be put off to the Monday following; and the other Causes on Cause-days removed in Course. Dominus Cancellarius declaravit præsens Parliamentum continuandum esse usque ad et in diem Jovis, vicesimum nonum diem instantis Martii, hora undecima Auroræ, Dominis sic decernentibus. The Answer of Sir John Home of Manderstone, to the Appeal of Sir John Home of Rentoun, was brought in. Ld. Leigh takes his Seat. This Day Thomas Lord Leigh sat first in Parliament, after the Death of his Father Edward Lord Leigh; having, at the Table, taken the Oaths, and made and subscribed the Declaration, and also took and subscribed the Oath of Abjuration, pursuant to the Statutes. With a Bill, intituled, "An Act for granting an Aid to His Majesty, by a Land Tax, to be raised in Great Britain, for the Service of the Year One Thousand Seven Hundred and Thirty-nine;" to which they desire the Concurrence of this House. With a Bill, intituled, "An Act to indemnify Persons who have omitted to qualify themselves for Offices and Employments within the Time limited by Law; and for allowing further Time for that Purpose;" to which they desire the Concurrence of this House. Message from H. C. to return Bramston's Bill. To return the Bill, intituled, "An Act for Sale of Part of the Estate late of Richard Berney Esquire, deceased, for discharging Encumbrances thereupon;" and to acquaint this House, that they have agreed to the same, without any Amendment. Hubert, to be added to Tracy's Nat. Bill. Then the said Mrs. Hubert, together with Christian Burkhard Reghlen and Zacharias Nieman, took the Oaths appointed, in order to their Naturalization. St. Nicholas Church, Worcester, Bill. 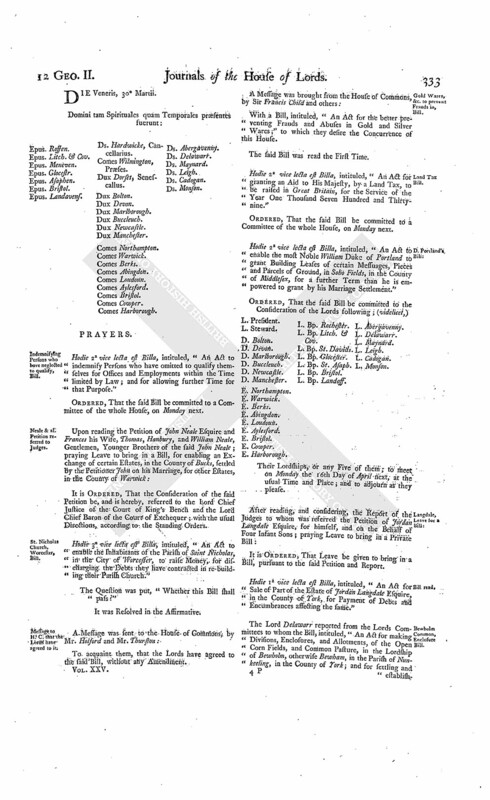 The Lord Bishop of Glocester reported from the Lords Committees to whom the Bill, intituled, "An Act to enable the Inhabitants of the Parish of Saint Nicholas, in the City of Worcester, to raise Money, for discharging the Debts they have contracted in re-building their Parish Church," was committed: "That they had considered the said Bill, and examined the Allegations thereof, which they found to be true; and that the Committee had gone through the Bill, and directed him to report the same to the House, without any Amendment." Governors Charter-House, &c. Petition referred to Judges. Hodie 2a vice lecta est Billa, intituled, "An Act for naturalizing James Tracy." Ordered, That the several Petitions, directed to lie on the Table till the last mentioned Bill was read a Second Time, be referred to the said Committee. Murray Kynnynmound against Rochead & al. It is Ordered, and Adjudged, by the Lords Spiritual and Temporal in Parliament assembled, That the said Appeals be, and they are hereby, dismissed this House; and that the several Interlocutors therein complained of be, and the same are hereby, affirmed. 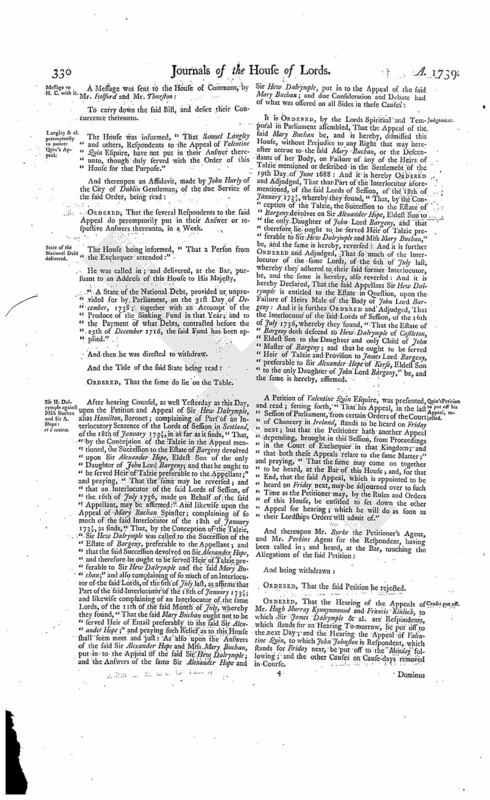 Hodie 1a vice lecta est Billa, intituled, "An Act to enable the most Noble William Duke of Portland to grant Building Leases of certain Messuages, Pieces and Parcels of Ground, in Soho Fields, in the County of Middlesex, for a further Term than he is empowered to grant by his Marriage Settlement." Clayton to enter into Recognizance for Watts. The House being moved, "That James Clayton, of The Middle Temple, may be permitted to enter into a Recognizance for Robert Watts Clerk, on account of his Appeal depending in this House; he being in Ireland:"
It is Ordered, That the said James Clayton may enter into a Recognizance for the Appellant, as desired. Indemnisying Persons who have neglected to qualify, Bill. Neale & al. Petition referred to Judges. It is Ordered, That the Consideration of the said Petition be, and is hereby, referred to the Lord Chief Justice of the Court of King's Bench and the Lord Chief Baron of the Court of Exchequer; with the usual Directions, according to the Standing Orders. 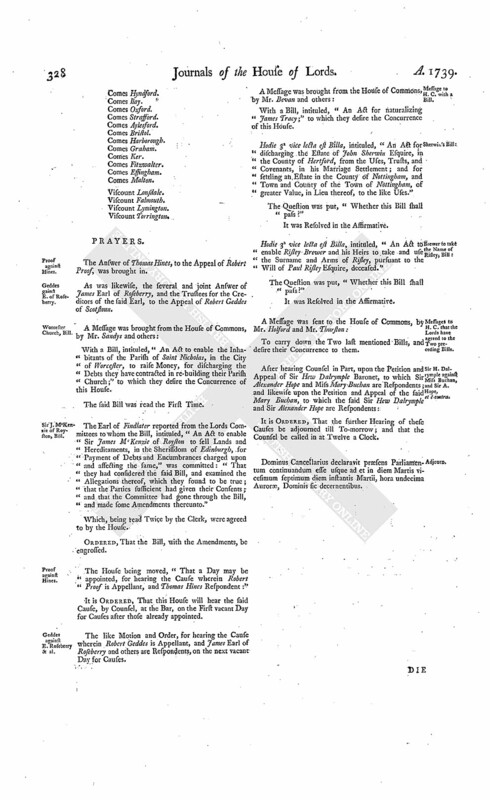 Hodie 3a vice lecta est Billa, intituled, "An Act to enable the Inhabitants of the Parish of Saint Nicholas, in the City of Worcester, to raise Money, for discharging the Debts they have contracted in re-building their Parish Church." Gold Wares, &c. to prevent Frauds in, Bill. With a Bill, intituled, "An Act for the better preventing Frauds and Abuses in Gold and Silver Wares;" to which they desire the Concurrence of this House. Hodie 2a vice lecta est Billa, intituled, "An Act for granting an Aid to His Majesty, by a Land Tax, to be raised in Great Britain, for the Service of the Year One Thousand Seven Hundred and Thirtynine." 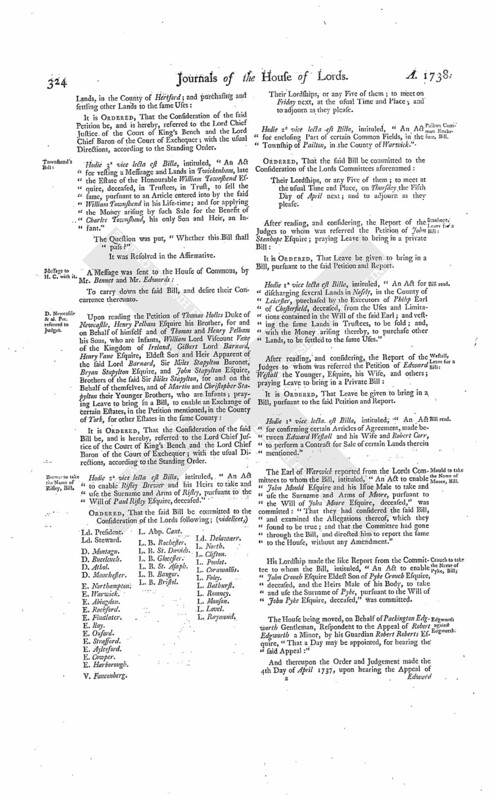 Hodie 2a vice lecta est Billa, intituled, "An Act to enable the most Noble William Duke of Portland to grant Building Leases of certain Messuages, Pieces and Parcels of Ground, in Soho Fields, in the County of Middlesex, for a further Term than he is empowered to grant by his Marriage Settlement." E. Harborough. L. Bp. Rochester. Hodie 1a vice lecta est Billa, intituled, "An Act for Sale of Part of the Estate of Jordan Langdale Esquire, in the County of York, for Payment of Debts and Encumbrances affecting the same." The Lord Delawarr reported from the Lords Committees to whom the Bill, intituled, "An Act for making Divisions, Enclosures, and Allotments, of the Open Corn Fields, and Common Pasture, in the Lordship of Bewholm, otherwise Bewham, in the Parish of Nunkeeling, in the County of York; and for settling and establishing the Payment of a Yearly Sum to the Impropriators of the Rectory of Nunkeeling aforesaid, and their Heirs, in Lieu of Tithes arising within the said Lordship, pursuant to Agreement between the said Impropriators and the Proprietors of the said Lands, was committed: "That they had considered the said Bill, and examined the Allegations thereof, which they found to be true; that the Parties concerned had given their Consents; and that the Committee had gone through the Bill, and made One Amendment thereunto." Accordingly the Lord Delawarr presented to the House a Bill, intituled, "An Act for enclosing Part of a Common, or Waste Grounds, called Hill Side, otherwise Lambden Common, in the Manor and Parish of Odiham, and County of Southampton." 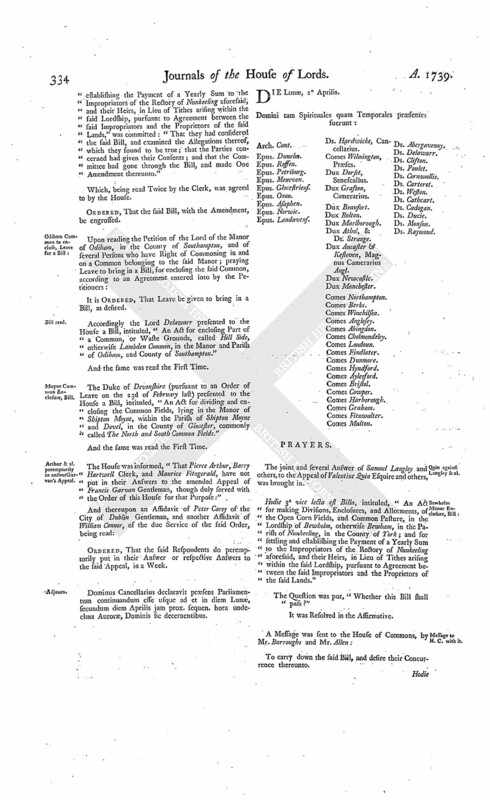 The Duke of Devonshire (pursuant to an Order of Leave on the 23d of February last) presented to the House a Bill, intituled, "An Act for dividing and enclosing the Common Fields, lying in the Manor of Shipton Moyne, within the Parish of Shipton Moyne and Dovel, in the County of Glocester, commonly called The North and South Common Fields." Arthur & al. peremptorily to answerGarvan's Appeal. The House was informed, "That Pierce Arthur, Barry Hartwell Clerk, and Maurice Fitzgerald, have not put in their Answers to the amended Appeal of Francis Garvan Gentleman, though duly served with the Order of this House for that Purpose:"
Dominus Cancellarius declaravit præsens Parliamentum continuandum esse usque ad et in diem Lunæ, secundum diem Aprilis jam prox. sequen. hora undecima Auroræ, Dominis sic decernentibus.